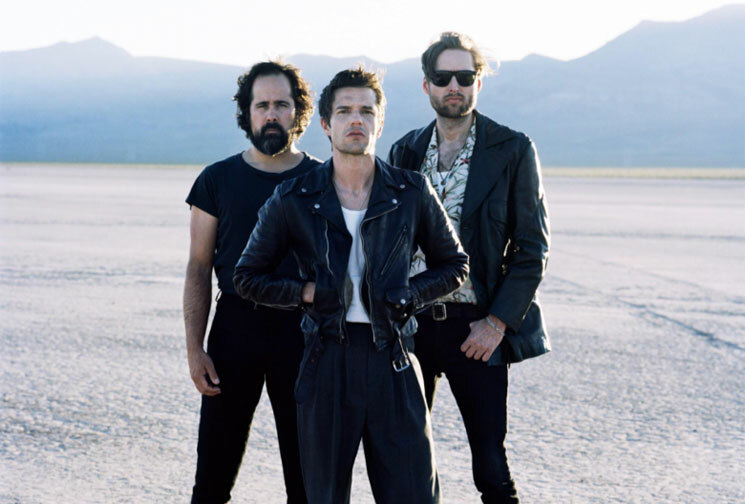 The Killers set out to single-handedly restore the Christmas spirit at KROQ's Almost Acoustic Christmas show over the weekend, after Queens of the Stone Age frontman Josh Homme kicked a photographer in the face and Morrissey cancelled his headlining slot due to illness. The Killers managed to show up as scheduled last night (December 10), and taught Homme a little lesson about how to respect their audience and the folks in the photo pit. During their set, frontman Brandon Flowers pulled the band's photographer Rob Loud onstage. "I'm not gonna kick you in the face," Flowers said. "Just come on up here. I just want to tell you to tell all your friends that you're welcome here, and that any Killers concert, you're safe and you're respected." After dedicating a song to the photo takers in the crowd, Flowers added, "They make us look good. We need to take care of these people." You can watch a clip of the Killers' onstage photog love below. Queens of the Stone Age weren't the only ones Flowers took shots at during the show. In the absence of Morrissey, the Killers treated the audience to their own rendition of the Smiths' "This Charming Man." Watch footage of that performance below. The Killers' album Wonderful Wonderful is available through Umusic.